Sunset Walk, Cannon Beach, Oregon. A couple walk their dog on the beach at sunset, Pacific Ocean. Oregon coast. United States. hd00:30Cannon Beach, Oregon, Sunset Cycle. Sunset at Haystack Rock in Cannon Beach, Oregon. A cyclist rides along the surf line. United States. 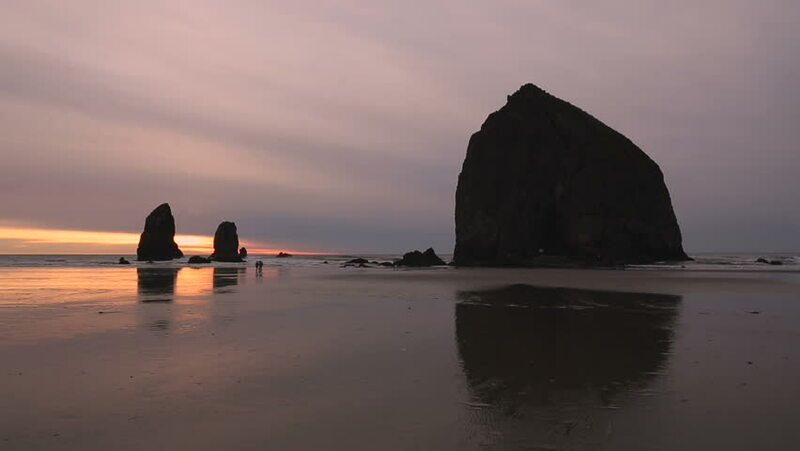 4k00:30Haystack Rock, Cannon Beach Sunset 4K. UHD. Sunset at Haystack Rock in Cannon Beach, Oregon as the surf washes up onto the beach. United States. 4K, UHD. hd00:22Drone footage slowly rising to reveal an amazing sunset in Cannon Beach on the Oregon coast. hd00:24Camera tilt down to seabirds on sandy beach at Pacific Northwest during sunset. 4k00:20A sunset with Haystack Hill on Cannon Beach, Oregon USA.